We specialize in custom design & remodeling, custom tile & marble work, roofing, flooring, plumbing, and landscaping. Call us or visit our website today and request your free assessment and estimate. 20+ years as a General Contractor / Handyman in North Texas providing outstanding workmanship, design, and remodeling services ever since. Our specialties are custom design & remodeling; custom tile & marble work; and roofing. Our customers particularly value the quality of our work and the affordable pricing for our services. Located in the North Dallas and available to assist customers in Frisco, Plano, The Colony, Little Elm, Carrollton, Lewisville and surrounding area. 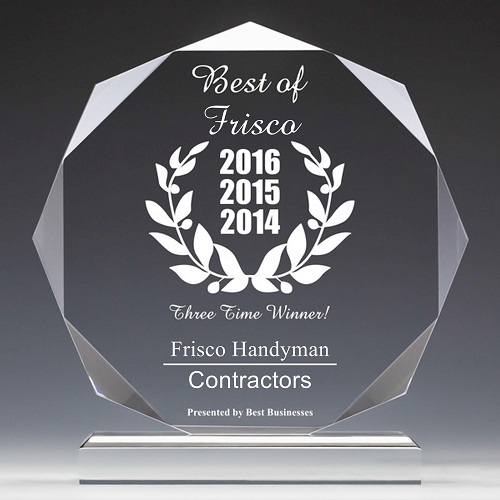 Owner & President of Frisco Handyman: John Nordhoff. Born and raised in this family business, John has been an individual entrepreneur and subcontractor in the North Texas area for over 20 years. He has worked with the FEMA Blue Tarp program; and, with the “Church Builders” Organization during the Katrina Relief Effort. He has worked as a contractor / handyman all across this nation – from the West coast in Los Angeles, California to the East coast in Boca Raton, Florida.